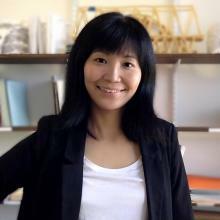 Ming Hu is an Assistant Professor at School of Architecture, Planning and Preservation, University of Maryland, College Park, affiliate faculty in the National Center for Smart Growth. She teaches technology courses focus on the integration of architectural design with structural, materials and building performance assessment. She is an architectural practitioner, educator and researcher with vast experience in high-performance building design, lifecycle assessment and building performance measurement and benchmarking. She has more than fourteen years’ experience working on international high-profile projects with HOK from the firm’s Washington, D.C. office. Her background includes training in the architectural discipline and years of practice across disciplines, which gives her a unique perspective and ability to weave these fields together in her research. Her research, teaching and outreach activities have been shaped by a domain of inquiry that does not fit in the box of “architectural discipline” or a “singular discipline.” Rather, her work centers on the intersection between green technologies and building systems, on exploring the inefficiency and vulnerability of existing design solutions, and on developing novel design technologies and frameworks to improve building performance and reduce environmental impact. Through practice, research and publications, her work comprises a coherent, integrated approach to research and professorship. She has contributed to the field of high-performance building design, particularly with her research work on net-zero building and lifecycle assessment. She has authored over 25 peer-reviewed papers and proceeding papers and over 40 technical reports. Her works have been selected as part of the Sustainability Exhibit at the 2017 United Nations Climate Change (COP23). She has conducted funded research totaling $262,783. She is author of the upcoming book “Net Zero Building: Predicted and Unintended Consequences” to be published by Routledge in 2019. She is recipient of 2019 Rockefeller Bellagio Center Academic Writing Residency. She is also investigating “Sense of Place” (SOP) from social, digital information and built environment perspectives and their relationship people’s value choices. The study of SOP in the design field present a unique opportunity to add new knowledge to this interdisciplinary topic.